You ever have one of those moments, where you just want to crawl under a rock? Yeah they happen often in my life. I was reminded of one of my top five moments while looking for a book through some old boxes, and I came across some old pictures. 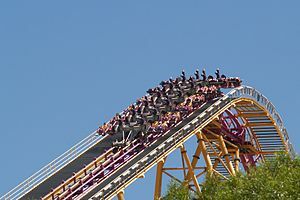 It was a group picture of my junior high school crowd at Six Flags Magic Mountain. A group of basketball-and-volleyball playing chicks and dudes enjoying roller coaster rides and laughter. Then I saw him in the picture. Those eyes. If you can picture a Latin version of Ryan Gosling that was him, wearing jeans, an OP t-shirt, and Nike shoes. He was my first love crush and this trip proved to be a memorable one. Ohhhh. He made me weak in the knees. My Latin Ryan Gosling. We had just gotten off that raft ride where everyone gets soaking wet no matter where you sit. As I got out of the raft, he extended his hand out to help me get out of the raft. Dude … as we held hands …. I swear I heard “This Magic Moment,” by Jay and The Americans. As we made our way to Colossus — an awesome ride with gut-wrenching drops and a speedy coaster where you can ride forwards or backwards– it happened. We were cracking up, recollecting who was screaming on the ride and who got soaked. He let go of my hand to tie his shoe. I turned to face him and continued the conversation. As he got up, we turned to the left and walked down the hill. The guys were calling us, telling us to hurry. There was no one in line. I still must’ve been on cloud nine because I didn’t see it. But there it was and it saw me. A large metal pole. The kind that has a light attached to it … yeah a light post. I crashed into a light post. I know what you’re thinking. It was dark wasn’t it? Night time. No. Broad daylight. Probably like one o’clock or something. My forehead and entire face hit the lamppost and made a noise loud enough that complete strangers stopped what they were doing and checked me out — the dumbass who crashed into the pole. I was a little dazed after bouncing off a giant piece of metal. My friends and my crowd? They were cracking up. They couldn’t help themselves. Me? I was mortified. Not only was I in physical pain, but the fact that my Latino Ryan Gosling was like a few feet away gave me emotional pain as well. He had a front-row seat to the show. I didn’t know what to do. What could I? I rubbed my forehead and chuckled a bit. I had my head down. He came to my side, shaking his head, and chuckling. “Are you O.K. ?” He asked brushing his hand across my forehead. I smiled. I didn’t mind the hand-holding.